Rule #1 this year is 'don't be an idiot, stay injury free'. It's hard to know what to do with all of this stoke sometimes. I want to run fast; I want to run far. Go go go. Luckily, Oslo has had just the solution to temper my running. 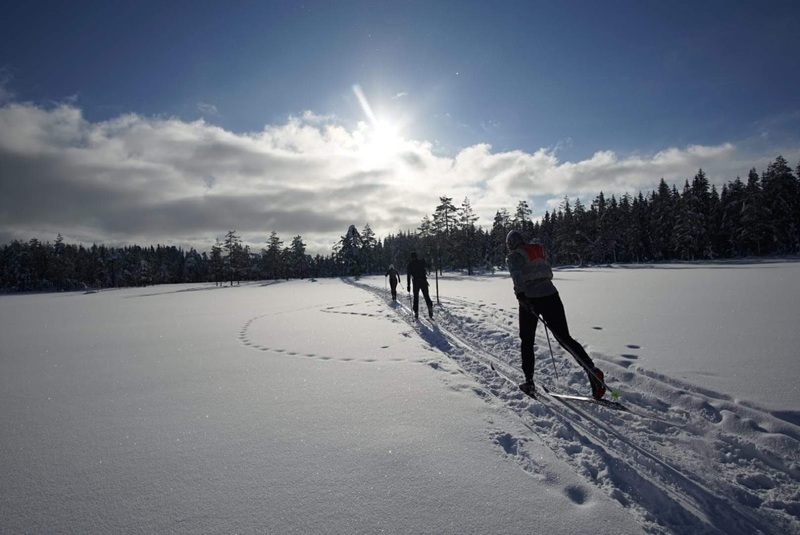 Oslo might be the cross-country skiing capital of the world, but winters I've spent here have been bad in that respect. This year is the first time I've really experienced the plethora of ski trails available in the forests around Oslo. 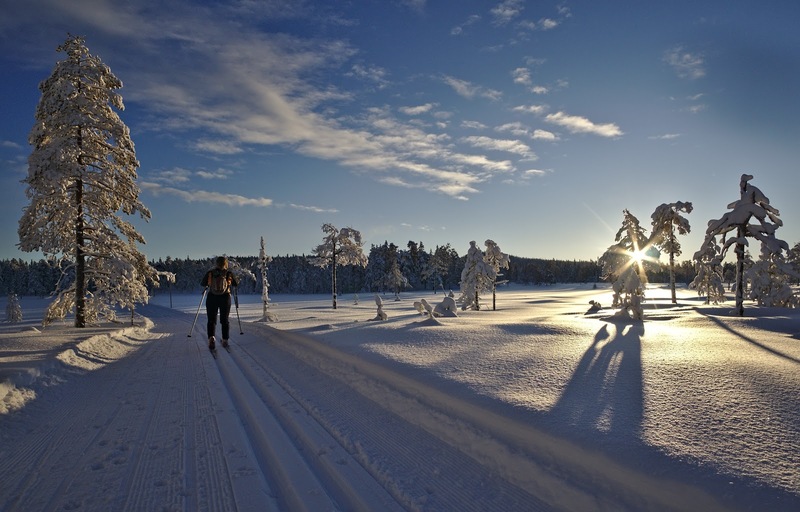 All the snow makes running tough, but is also a good incentive to cross-train on skis. I rarely write about my day-to-day training, but I was thinking about how important 'the grind' - those every outings actually are for everything else I'm able to do. So as I start a month in on the alien planet of Arizona, I thought I would try to summarize my training so far this year. I've talked a bit about my audacious goals earlier this year - I am training to run an 80K and two mountainous 100Ks. At this point in my season I am just trying to get as fit as possible, not focusing too much on overall mileage but running a moderate amount and doing a lot of fairly high intensity workouts. The biggest difference this season compared to the previous is that I am running two interval sessions a week with the OSIF track team. I spent some time easing into this, doing few reps at each session, but now it is starting to feel normal. I'll switch over to more focus on hills and vertical in late April/ early May. I've also only ridden my bike to work once this year, something I did a lot of last year, foregoing cycling for skiing and running. So here's a summary of how the training has gone down so far this year! This was the week we embarked (and bailed) on the long ski trip from Gjøvik to Oslo. Took Audun out for a long skate ski. I had more fun than he did. We watch Presta for the weekend, and took her out for a tiring ski in Lillomarka. She is not an ultraendurance dog - yet. This was the week when snowmaggedon hit Oslo, and I spent 30 minutes trying to dig out my car to go for a 'quick lunchtime ski' before capitulating and taking the bus. Quick and lunchtime did not happen. At least ski did! 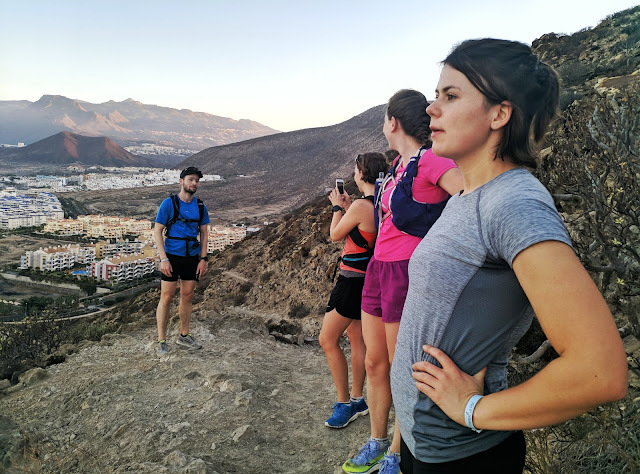 This was the week in Tenerife, my new personal weekly distance record (actually since we arrived on Sunday it ended up being 134K in 7 days). It was really cool to see what I could do when running and relaxing were my main priorities! 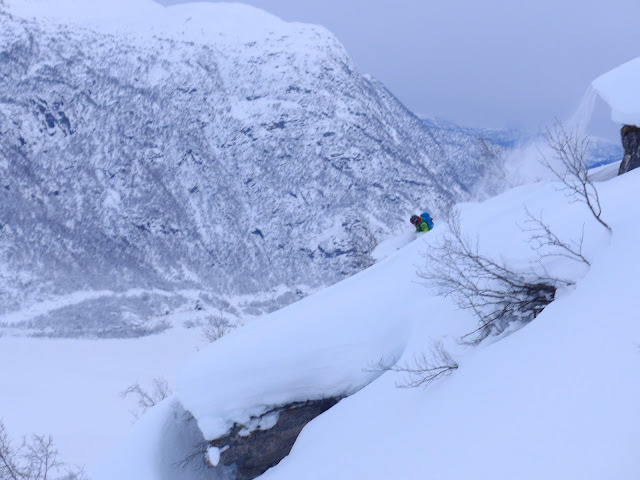 Torfinn in deep on the nameless peak 1554 in Sogndal. I only ran one interval session this week, but I remember really feeling great about it, like the week in Tenerife had given me a fitness boost. Then I went and frostbit my fingertips in Sogndal. Vibeke and Solveig on a snowy day in Vestmarka. During the short intervals on Thursday, 5x(300-200)m, I started WAY too hard and consequently ate s***. The breaks between each rep were super short - only 30s - and I wasn't recovering at all from the anaerobic effort. I was supposed to run 8-12 reps but ended up bailing after 5 when I started to see black. So now I know what too hard feels like. We stayed at home for the weekend and I managed to put in my first really long run of the year - 32 km - mostly on pavement due to the snow. On Sunday I had a nice and mellow ski in Vestmarka with Vibeke and co. The conditions were super loose, because it had been snowing faster than the groomer could prep. Me and Hanne Marthe on a magicial weekday ski in Lillomarka. After several grey and snowy weeks, when I saw sun on the forecast on a Tuesday I knew I had to take advantage of it. Luckily Hanne Marthe had a night shift and was able to take time off to ski with me. It was postcard prefect conditions and fresh corduroy in Lillomarka - definitely the right day to play hooky. Audun and I also got away to beautiful Rondane this weekend. Marion on one of the many lake crossings in Nordmarka. I got in another solid long run this weekend. I was particularly pleased with this one because I wasn't feeling that excited about the run when I headed out. But I managed to collect myself and even hold a pretty decent pace, a good harbinger of things to come. On Sunday, Audun and I met up with our friends Marion and Eirik for a long ski Nordmarka. The kilometers passed quickly with people to chat with and gorgeous weather. All the intervals sessions were money this week. I was a little intimidated by the prospect of short hill sprints, but managed to find my groove and was surprised to find myself a lot faster than many of my OSI teammates who regularly thrash me on a flat track. I guess all the mountain running is good for something. The second interval session, 3x6 laps or 1.6K, was interesting because the intervals were so long, so it was all about find a controlled, zen pace, which I feel we succeeded at. This weekend was the OSI cabin trip, during which I had too much fun to take any pictures. I got in a decent, albeit hard, 30K ski on Saturday trying to keep up with much better skiers than me, and a much more sordid, hungover ski on Sunday. The view from the climb up the 'mountain trail' (Fjelløypa) in Bjorli. It was a stunner. My interval session on Monday was absolutely insane. I had planned to do 8x1000m, but felt so good I decided to tack on two more. With Gustav's (the OSI coach) help, I ran the last two faster than all the previous reps, always a good feeling. I limped through the 300-200m on Thursday, managing not to blow up but still not feeling great about these short reps.
On the weekend, Audun and I went to Bjorli for my mother-in-law's 60th birthday. I put in a solid cross-country ski on Saturday, half solo half with Audun, on the awe-inspiring mountain trails around Bjorli. I congratulate you if you made it to the end of this long-winded post! Here's to more solid spring training, and no injuries. If you want more live updates on my training, feel free to follow me on Strava.